YOU GET MORE IN MARION! 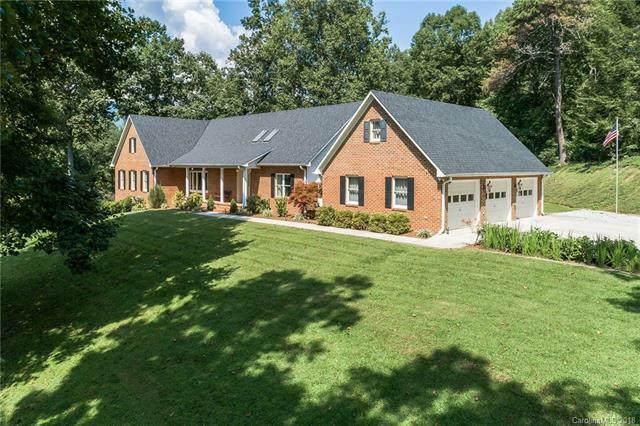 Custom Built Solid Brick Home on 5+ Unrestricted Tranquil Acres! Space for RV, truck, motor boat, antique cars. Total of 6 garages! Everything you need on one level. 2900 sq ft on first floor with great flow. Workshop, Craft room or game room, and Sunroom! Greenhouse. Gazebo, Garden area. Pecan trees, grapes, & blueberries. Oh, my--what more could you want? Plenty of sunshine for solar panels and space to grow vegetables and grapes. Can sell from unrestricted acreage. 2nd fireplace in basement; plumbed for another bathroom. Zoned heat pumps. New roof & water heater in 2016. Wired for generator. Hot & cold spigots & electric on outside for RV. 8' garage doors for your truck. Storage galore. Easily get your motor boat to gorgeous Lake James. Paved roads; easy in, easy out. Minutes from restaurants & shopping. Easy drive to Asheville. NO ZONING. NO HOA. Can be subdivided. Immaculate! Come see!